It’s Sir Festus’ Apology Gun, a dubious artifact from the Very Polite War! Ahem . . . this gun is four and a half feet long. I love the bristling spikes, the flared end, the threatening ferocity of it! Amanda says she made the gun purposely beat up and aged looking (spot welds, rusted metal, etc. ), since the weapon has been handed down through generations of squires. Totally in keeping with the Odd-Fish aesthetic! Not visible in this photo is a detail she built onto the top of the gunstock: a switch for setting the intent of the apology from “sincere” to “sarcastic”. Brilliant! Amanda says that future models of the “Apology Gun of Epic-ness” might include an actual way to fire apologies. OH YES PLEASE DO THIS. Little by little, let’s infect the real world with items from the Odd-Fish world, until we totally take over! When Kenta-Rin first told me she was making Odd-Fish dolls, I was pretty excited. But I was absolutely floored when I saw the final product! Both cute and fierce. That elaborate silver kitten armor rocks my socks—the paw gauntlets, the beaded chain mail and helmet, the silver crisscross mesh, the chest plate, the lance—it’s a triumph. Kenta-Rin wrote, “This is the most complicated doll I have ever done.” And it’s amazing work. The waitress Jo has this innocent look to her that’s a nice contrast to the armored Jo. I like the idea of two versions of the same character in different clothes; it gives a great sense of how Jo has changed throughout the story. Check out Kenta-Rin’s DeviantArt profile for more genius. One of the most ingenious and original pieces of Odd-Fish art I’ve received! It’s two pages from Jo’s father’s secret message to her, written in a code of colors, here executed in embroidery. This is one of the pieces I heard the most praise for at the Odd-Fish art show. I love it myself; in fact, it’s hanging in my apartment. Is there something a little weird about hanging up fan art from your own book in your house? Whatever, I do it. And this piece stands up well enough on its own, as a kind of abstract thing, that I can get away with it . . . Bravo, Jac! Sara made these cool buttons for the Odd-Fish art show back in April 2010. They got snapped up so quickly, I have only a few of my own anymore! I can see why: you can tell from the clean, iconic design of each button that Sara is a professional designer. 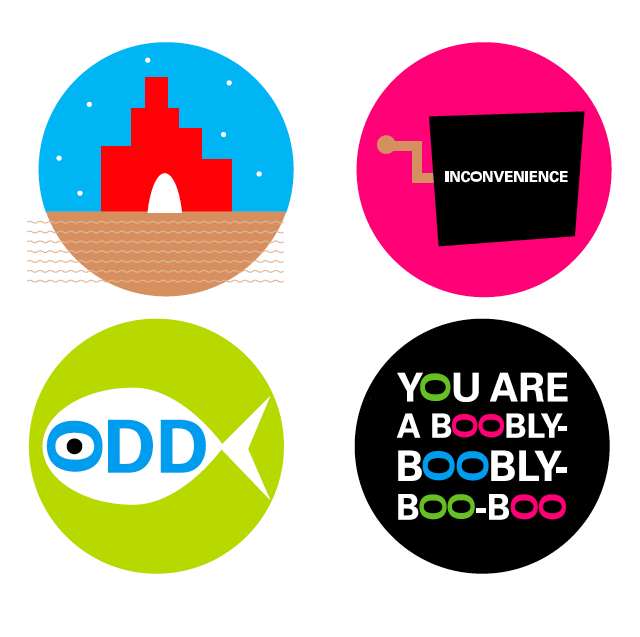 I particularly like the way Sara treats the letter “O” in “boobly-boobly-boo-boo” and the rebus-like “Odd-Fish” button. Heather wears the “Inconvenience” button on her coat. The ruby palace is great too. Well done, Sara! It’s a papier-mache scale model of Colonel Korsakov’s oracular digestion! Not only does it light up, but if you open it, you can find four spools unrolling ticker-tape of the digestion’s infallible advice: “Hark! Peril yonder! Plum pudding required to ascertain coordinates”, or “Intestines decalibrated. Message unclear. Need more ham”, or “Bountiful boons abound. Fancy meats recommended to bolster advantage”, or “Emergency! Surrounded by enemies! Excellent time for eggs.” It is not often that an author is given the opportunity to eavesdrop on his own character’s digestion! I love the drooping, trailing intestines, the delicate papier-mache of the stomach itself, and the supernatural glow of the light. I am currently cherishing this as the World’s Awesomest Lamp at my house. Here’s the fish that ate up Korsakov’s plane and later spewed it into Eldritch City! Georgia stretched iridescent, semi-transparent green glittery fabric over a copper frame to create the fish. And inside its belly (hanging on fish line) we can spy Korsakov’s plane and the Odd-Fish lodge, complete with ostrich landing pad on the roof that says “Odd-Fish Ostriches Only”! We hung this in the middle of the gallery for the Odd-Fish art show in April 2010, and it was a fantastic centerpiece for the room. A small idol of the All-Devouring Mother made of a red plastic cup! The genius is in the simplicity: what better way to convey the idea of “emptiness” than an empty cup? Conceptual! Festooned with eyes, bristling with tentacles, gaping with toothy mouths, this looks like the kind of idol an aspiring Silent Sister might have secretly made herself and is keeping under her bed.